The world is cruel, the world is wicked, it’s remakes alone Disney can trust in this industry. They are its only friend. 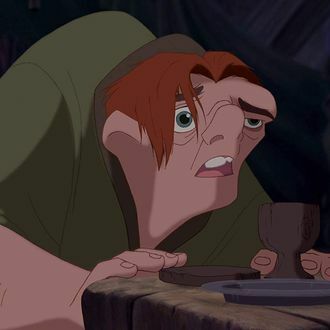 After meticulously re-creating Beauty and the Beast, Aladdin, The Lion King, and soon Mulan with a combination of live-action and CGI technology, Disney has set its sights on doing the same for The Hunchback of Notre Dame. According to Deadline, the studio has enlisted Tony-winning M. Butterfly playwright David Henry Hwang, who also wrote the books for Disney’s stage musicals Aida and Tarzan, to write the script of the movie, with Alan Menken and Stephen Schwartz reuniting to write music, and Josh Gad producing along with the production company Mandeville films, which also produced Beauty and the Beast. Gad, who played a gay LeFou in Beauty and the Beast, might play the lead character in Hunchback, though Deadline insists “insiders at the studio said no casting is solid at this point.” The new film will pull from the animated movie as well as Victor Hugo’s novel, but not on the stage version based on the movie that was originally produced in Europe, according to Deadline. They should keep the sad ending from the book, though. Why make Hunchback if you’re not going to mess up some children!